Shire Assembly Service - Shetland Shed By selecting this option, an expert assembly team will install the product for you. A solid, level concrete or paving slab base must be prepared in advance and accessible for the installers to carry out the assembly. EcoBase Plastic Base kit 2x1.5m (12 tiles) A sturdy base kit made from interlocking modular plastic tiles, complete with a weed suppressing membrane. Delivered independent of the building within 2 working days. 5 Litre Nut Brown Protek Shed & Fence Treatment Tub A rich, deep, dark brown wood stain with a lot of depth and beauty. Estimated coverage 10m2 per litre. Delivery will be made independent of your main purchase, typically 3-5 days from order placement. 5 Litre Gold Protek Shed & Fence Treatment Tub Warm and bright golden colour that is very popular. Estimated coverage 10m2 per litre. Delivery will be made independent of your main purchase, typically 3-5 days from order placement. 5 Litre Russet Protek Shed & Fence Treatment Tub Refreshing and pleasing Russet brown woodstain. Estimated coverage 10m2 per litre. Delivery will be made independent of your main purchase, typically 3-5 days from order placement. 5 Litre Rosewood Protek Shed & Fence Treatment Tub A vibrant and warm brown colour with a deep red tone. Estimated coverage 10m2 per litre. Delivery will be made independent of your main purchase, typically 3-5 days from order placement. 5 Litre Dark Green Protek Shed & Fence Treatment Tub A dark green colour with a yellow undertone. Estimated coverage 10m2 per litre. Delivery will be made independent of your main purchase, typically 3-5 days from order placement. 5 Litre Cedar Protek Shed & Fence Treatment Tub Traditional red cedar colour with a pleasant brown undertone. Estimated coverage 10m2 per litre. Delivery will be made independent of your main purchase, typically 3-5 days from order placement. 5 Litre Golden Brown Protek Shed & Fence Treatment Tub Natural looking golden brown woodstain. Estimated coverage 10m2 per litre. Delivery will be made independent of your main purchase, typically 3-5 days from order placement. 5 Litre Pale Green Protek Shed & Fence Treatment Tub Pale Green stain similar to the colour of pressure treated timber. Estimated coverage 10m2 per litre. Delivery will be made independent of your main purchase, typically 3-5 days from order placement. 5 Litre Black Protek Shed & Fence Treatment Tub Popular modern choice for your garden woodwork. Estimated coverage 10m2 per litre. Delivery will be made independent of your main purchase, typically 3-5 days from order placement. 5 Litre Light Green Protek Shed & Fence Treatment Tub A soft light green to compliment foliage. Estimated coverage 10m2 per litre. Delivery will be made independent of your main purchase, typically 3-5 days from order placement. 5 Litre Moss Green Protek Shed & Fence Treatment Tub Rich, deep green woodstain. Estimated coverage 10m2 per litre. Delivery will be made independent of your main purchase, typically 3-5 days from order placement. 5 Litre Dark Blue Protek Shed & Fence Treatment Tub A Dark blue woodstain, like faded denim. Estimated coverage 10m2 per litre. Delivery will be made independent of your main purchase, typically 3-5 days from order placement. A compact but perfectly formed shed, excellent for tool storage but with the door located on the gable end you can easily fit in a bicycle. The wall panels are constructed of tongue and groove cladding and supplied in modular sections. The main advantage of a modular design is that each individual panel will be small enough (in one or both dimensions) to be carried by one person and will fit through a standard pedestrian door. As a concequence the individual boards may not line up perfectly with those on adjacent panels, due to the variences in the natural timber cladding. The flooring provided is a solid sheet OSB. Fixtures and fittings are supplied with the shed along with felt to cover the roof and full instructions. External Width (max) 1370mm - 4' 6"
External Depth (max) 1876mm - 6' 2"
External Height (max) 2046mm - 6' 9"
Footprint Width 1197mm - 3' 11"
Footprint Depth 1828mm - 6' 0"
Internal Width (min) 1129mm - 3' 8"
Internal Depth (min) 1760mm - 5' 9"
Internal Height (min) 1939mm - 6' 4"
Ridge Height 2046mm - 6' 9"
Eaves Height 1734mm - 5' 8"
Door Height 1709mm - 5' 7"
Door Width 665mm - 2' 2"
Door Opening Height 1709mm - 5' 7"
Door Opening Width 665mm - 2' 2"
Framing Width 34mm - 0' 1"
Framing Depth 34mm - 0' 1"
The Shire Shetland Apex Shed 6x4 is delivered from central UK stocks by the manufacturer. Shire's own experienced personnel undertake delivery to ensure your goods arrive in a perfect condition. Shire operate mostly small, flat-bed trucks. If a dustbin lorry can reach your property, Shire should too. Limited access? Please call us prior to ordering to avoid a costly abortive delivery. Unloading will take place at the kerb-side or your adjacent driveway. Vehicles will not leave the public highway. The driver, at their discretion, may be willing to carry the goods to your garden. Shire will not carry goods through or into your home, therefore you may wish to arrange some extra help privately. 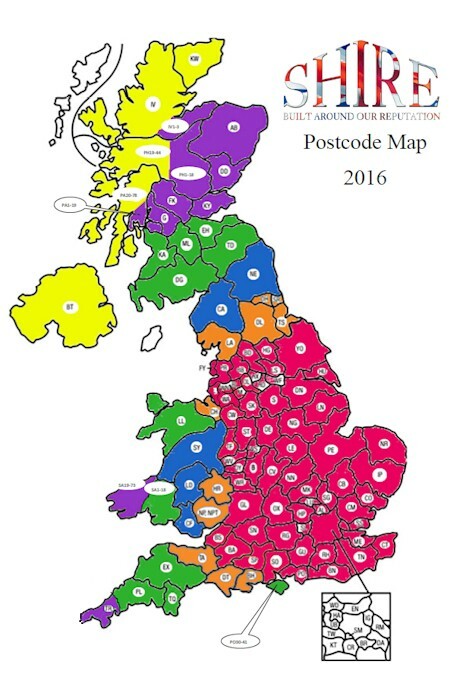 Shire offer a free delivery service within Central and Southern England, as indicated by their red zone on the map below. The above postcode checker will confirm this for you. For products on '3-7 days' delivery located within the majority of Shire's free red zone, during the checkout process you will be offered a calendar which allows you to select a preferred delivery date. Shire will endeavour to deliver on the date you have chosen. You will be promptly notified in the rare event that an alternative date is necessary for logistical reasons. As BA, BN, BS, SO & SP postcodes are serviced on a 2-day (overnight) run, the actual delivery day may vary by +/- 1 day of the date chosen. The following red zone locations are excluded from the Pick A Day service; BB, BD, FY, GU, PR & PO. Note: When an installation option has been chosen, a Pick-A-Day selection will not be offered; due to additional, post-order labour scheduling. Delivery will typically occur within the period quoted on this product. For those products outside the '3-7 days' offer, you will be given the opportunity to chose your delivery date via Shire's online booking portal; a link will be sent by text or email a day or so after order. If a date is not chosen, Shire will notify you in advance by either telephone, text or email to confirm their date of delivery. Less frequently serviced locations such as those outside Shire's red zone, may be subject to an extended period of up to an additional 7-14 days. These distant locations include North and South-West England, Wales and Scotland. If an installation option is chosen the product delivery period will increase by approximately 14 days, to accommodate additional labour scheduling. Therefore, a '14 Day' self-assembly delivery will become a '28 day' installed order. The only offshore location Shire deliver to is the Isle of Wight; PO30-41. A green zone delivery charge applies to this island. Shire does not service the following distant onshore locations; Northern Ireland (BT) and Scottish Highlands (IV, KW, PA20-78 and PH19-44). These form the yellow zone as shown upon the lower map. All offshore locations are excluded too, examples being; Guernsey (GY), Western Isles (HS), Isle of Man (IM), Jersey (JE), Orkney (KW), Shetland (ZE) and Scottish Islands (PA & PH). Due to additional Shire zone fees, certain distant locations can only be serviced at a surcharge (at cost). The above post code checker can confirm if a surcharge will apply. This map offers a visual impression of the four surcharge zones. Delivery is free within the central red zone. No delivery service is available to the yellow zone. The windowed side panel can be positioned in a number of places when building this shed. We work tirelessly to ensure that our extensive product range is competitively priced through regular monitoring. In the rare event that you find the Shire Shetland Apex Shed 6x4 from another online retailer at a lower price then please let us know, we'll do our best to match or even beat it! The manufacturer recommends that you should treat the exposed wooden parts with a quality wood preservative, prior to installation. Do allow sufficient drying time before you then install though, otherwise things may get a little messy! One Garden is proud to support British manufacturing. Products bearing this mark are directly sourced from official, genuine UK manufacturers. Some products have installation available as an option. For an extra charge, professionals will come to your property to install the product. An appropriately sized, firm and level base will need to be available for them to install. The process where the surface of wood is exposed to a preservative by immersion in an open tank or by deluge spray booth. This treatment is common for above ground use. A tongue & groove jointed boarding offering a smooth planed finish. Each upper face is shaped with a shallow curve to offer a shiplap, overlapping appearance. Oriented Strand Board also known as OSB. Used in the building industry. Layers of wood flakes set within a glue-like resin are compressed into a solid sheet. A garden building roofing felt in its commonest form. Coated externally with small stone flakes or grit to deter the effects of weathering. A single sheet of non-toughened standard glass, most often used in garden buildings like summerhouses and sheds. A steel hasp and staple set is often used for securing wooden doors and gates. Interlocked when closed, being securable by a padlock (not supplied) threaded through an integral loop. Finish and style can vary to suit product. 5 out of 5 Bernard Brookes, Rowley Regis West Midllands. I found this shed to be very good value. The company service and delivery was excellent. Click here to read all 1 reviews. Found a lower offer on our Shire Shetland Apex Shed 6x4? Oh no, please tell us! As we aim to beat any like-for-like Shire Wooden Sheds online offer, just let us know using our online form (see our 'Price Watch' tab above)... and we'll be in touch. If this Shetland Apex 6x4 doesn't quite fit-the-bill, take a look at the suggested alternatives above or our full Wooden Sheds range for a greater choice.